September 19, 2018 (New York, NY) – Just weeks after hitting $1 trillion in market cap, Amazon has reached another milestone: It has jumped to third place among US digital ad platforms, surpassing Oath and Microsoft for the first time. The shift comes after eMarketer increased its projections for Amazon’s ad business in its latest US advertising forecast. The revisions are partly the result of strong organic growth in ad revenues, coupled with accounting changes that now classify some advertising services (previously classified as cost of sales) as revenues. In 2018, Amazon will generate $4.61 billion in US ad revenues, higher than the $2.89 billion eMarketer had projected in March. That gives the ecommerce giant a 4.15% share of the US digital ad market. The jump in Amazon’s US market share is also partly due to consumers increasingly starting product searches on the site, rather than on Google. “That increased search traffic gives third-party sellers a reason to increase bids for keywords on Amazon,” Peart said. 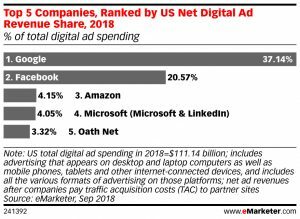 This year, Google and Facebook will control a combined 57.7% of US digital ad revenues (37.1% and 20.6%, respectively), down from 59.1% last year, as the overall digital advertising pie grows and smaller players capture a growing share. eMarketer has also increased its projections for Amazon mobile. 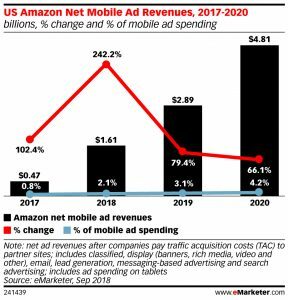 This year, Amazon will grab $1.61 billion in net mobile ad revenues, a 242% jump over 2017. That means Amazon now has a 2.1% share of the US mobile ad market.